The mantra of Million Dollar Journey is to build wealth through saving and investing. As this is my belief of the easiest way for regular working folk (like our family) to build serious wealth to someday reach financial freedom. How early you reach financial freedom depends on how aggressive you save. Saving 50% of your income can result in achieving financial freedom in as little as 16 years. Imagine an equal two-income household where you can live on one income and save the other. Starting at age 24, that couple could potentially reach financial freedom by the age of 40. All without sacrificing too much in terms of lifestyle. Many people have done this, heck our family is doing it. I’m closing in on 40 next year (imagine, I started this blog @ age 27) and by that point, most of our recurring expenses will be covered by our long-term dividend portfolio (woot!). Investing with your eye on the horizon (ie. long term) is an extremely important discipline. Why? Because it lets the magic of compounding do the heavy lifting. 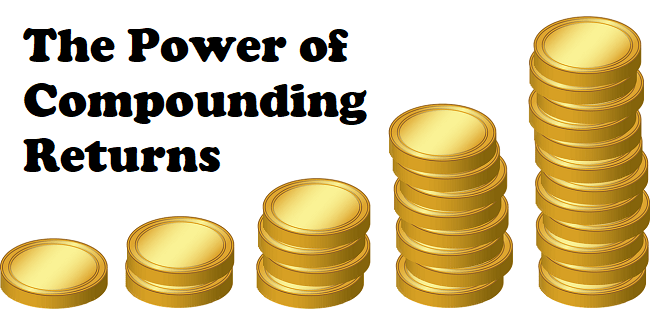 The more time that compounding is allowed to brew, the greater the impact on your wealth. What is compound interest (returns)? It’s when you keep your investment returns invested (not withdrawn), and you let not only your original capital grow but also the previously accumulated returns. For example, say you put $10,000 into a TFSA and your portfolio returned 10% last year, so now you have $11,000 in your TFSA. So your TFSA gained $1,000. Dandy. Say that a year passes, and your portfolio returned another 10%. You didn’t just gain 10% on your original capital of $10,000, but also 10% on your returns, for a new portfolio value of $12,100. Repeat for years going forward. So as you can see, if you are properly invested over the long term, your returns will compound over the years. The more years the returns are allowed to compound, the greater the effect. Compounding can be represented as a math formula. To keep things as simple as possible let’s assume that the compounding happens annually. Pay particular attention to the exponential (years) of the interest rate. That just shows that time is the fuel that keeps feeding the compounding beast. Combine compounding with savings habits and now you are maximizing this force of nature. Let’s use a realistic example of maximizing your TFSA annually. To keep thing simple, let’s assume that the TFSA contribution limit is permanently set to $5,500, and you use a passive index investing strategy that averages a long-term return of 7%. The table and chart show that by year 20, the market returns start to overtake the total contribution amounts. By year 30, market returns are double contributions. By year 40, market returns are 4x contributions. By year 50, market returns are 7x contributions and year 60, 12x contributions. Compounding really takes off with an exponential curve that will look like a vertical slope if you give it enough time. The greater your market return, the greater the power of compound interest. 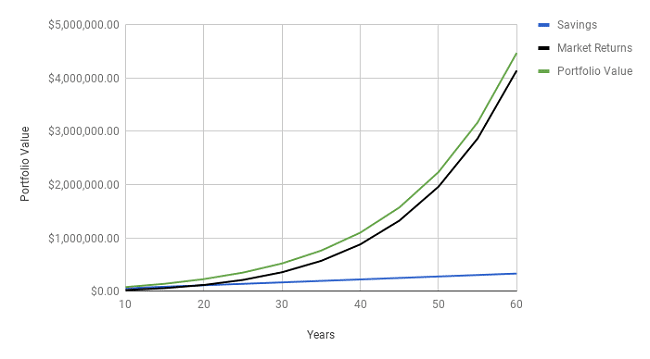 If you manage to increase your return by a percentage point (think lowering your MER), your compound interest works harder and will show significant results after 20-30 years. See this post for more details. Warren Buffett, perhaps the greatest long-term investor of our time, became a millionaire in his 30’s. However, he didn’t reach billionaire status until he was 56. He continued to let his returns compound, and now at age 87 (about 30 years since his first billion), his net worth has grown to $84.1 billion. As a personal example, I have been saving and investing for a couple of decades (since I was a teenager). Compounding combined with our savings habits has resulted in a portfolio worth over $1M that pays out a healthy dividend. The portfolio is to the point where annual gains are greater than our contributions. With compounding @ 7%, it’s nice to imagine that our portfolio could be worth $5.5M in 25 years without any further contributions, but the reality is that we’ll be living off our portfolio much before then. To close things off, this is just another article advocating long-term investing due to the power of compound interest. When I say long-term, greater than 20 years is ideal because that is when compounding really starts to take over. The more you save and contribute to your portfolio in the early days, the longer you’ll give compounding to do its work, which means the wealthier your future self will be. I definitely agree that for working folks like us, the best way to build wealth is through savings and investing. My two favourite accounts to invest in are the TFSA and RRSP because one of the key components to allow your money to work harder is to shelter it from taxes. For the RRSP, if you succeed with compounding a couple of millions in your account, you will have a tax minimization problem at retirement. It’s a problem that I am more than willing to tackle heads on if I am fortunate enough to accumulate that much money. Love these financial analyst’s who base predict all these great numbers on 10% returns…..who the hell gets 10% year after year…..nobody. it would be more advantageous if you worked with real numbers instead of false information. The table is based on 7% return. Possibly a stupid question but one thing I have always wondered is what causes the “compounding” in a buy and hold strategy (of equities)? I understand the concept if you get dividends, then using a DRIP or similar strategy leads to the overall amount increasing over time. However, if you are buying a share for, say $20, and hold for 10 years to sell at $200, you are making a profit but it hasn’t really “compounded” has it? Hey Mike, that is actually a great question. Re-invested dividends makes perfect sense on how compounding can work, but what the stock growth? Essentially, the earnings (assuming the company is profitable) that companies keep (not paid out in dividends), can be used by management to re-invest and grow the company. The goal being to grow earnings. Since stocks trade as a multiple of earnings (p/e), higher earnings = high stock price. It’s implied that the earnings are being compounded. Does this make sense? Wow, you have been blogging for a long time!! I started investing when I was around 20, so a bit older than you. After reading this post I’m trying to remember how I started exactly. My friends weren’t investing yet and my parents didn’t set anything up for me. I wish I could remember where it came from. In any case I look forward to the future when the curve rises more sharply! Great that you started so early. Just keep contributing to the account, stick to the investment strategy (hopefully low fee-based), and ride the wave. To put compounding and consistent contributions in another perspective, when your TFSA reaches around $80k, annual returns will approximately match your annual contributions (assuming 7% and $5500/year contribution). Another great example of beautiful compounding over 18 or so years is the RESP! I’m excited to see our son’s RESP grow over the years to fund his post-secondary education. Happy 40th birthday soon, by the way! Congrats on FI and living off dividends!! Long time listener, second time commenter. Just wondering how paying for your kids (I think you have kids?) fits into this plan. Will your passive dividend income be able to support students in post-secondary education, as well as you and your spouse? Hi DMc, great question. I track our expenses and post here on an annual basis which includes kids expenses (lots of activities etc). Our burn rate is between $50-$55k in most years. For big expenses like University, we have a family RESP setup for both kids that is maximized every year. By the time post-secondary starts, the accounts should have more than enough funds to pay for their first degree (maybe even their Masters if that’s eligible). I would say that without kid expenses, our burn rate is closer to the $45k/year which should make $60k/year in passive income very comfortable.